The next Batman game is called Batman: Arkham Origins, and it'll be out October 25 for PS3, Xbox 360, Wii U, and PC. It's a prequel to Arkham Asylum and Arkham City. Warner Bros. Montreal is making the game, taking the mantle from Rocksteady Studios, the developer behind the critically-acclaimed first two. 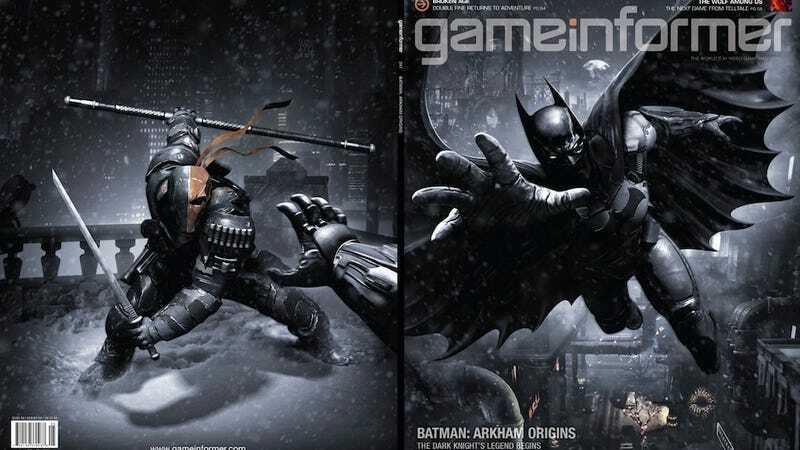 You can see one of the villains, Deathstroke, make an appearance on the back of the Game Informer cover pictured above. The game's plot involves eight of the world's deadliest assassins coming to Gotham City on Christmas Eve. Their target: Batman, of course. The game takes place on the streets of Gotham, according to the developers, who hyped the game in a video on Game Informer's website. There's also a handheld spin-off called Batman: Arkham Origins Blackgate for 3DS and Vita, a 2.5-D Metroid-style game developed by Armature Studios, the development house led by ex-Retro staffers who worked on Metroid Prime. This month's issue of Game Informer has details on both games. For a while now we've been hearing rumors about the next Arkham game, which will be written by different people than the previous two. Last year, Variety reported that the next Arkham game would be a prequel.